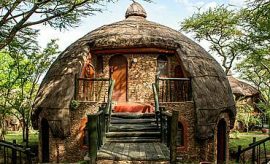 Soroi Serengeti Lodge is located in the western side of central sector of the Serengeti National Park in Tanzania. 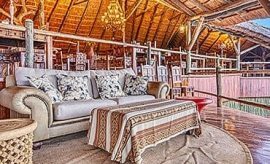 It is a superbly built luxury Mbali Mbali safari accommodation, a must stop for discerning adventurers who travel in Africa. 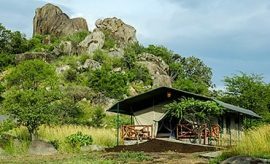 Set high on a majestic granite rocky outcrop overlooking the Musabi plains panorama and shading distant and nearby hills; it is cushioned by the breath-taking views over the Serengeti plains and its fantastic wildlife, the Soroi is a safari accommodation and location to be prized for its own sake on your AfricanMecca vacation in Tanzania. The architect has built the thatched chalets into a stilt lodge type tree-house design, elevated on strong planks to nestle against the tree-clad hillside, linked by stout wooden aerial walkways. The walkways seem to float in the air overlooking the spectacular vistas below which are integrated into the fabric of the design, unobstructed, whether you are dining, bathing, lying in bed or simply drinking in the sense of air and freedom with your sundowner cocktails from the elevation of the open fireplace decking. The Serengeti is a UNESCO World Heritage Site, 5700 square miles of protected ecosystem where you can see the wonder of the natural world unfold right in front of you, the annual migration of over a million wildebeests with thousands of zebras circumambulating the vast plains all the way to Kenya’s Masai Mara and back. This never-to-be-forgotten life time experience is the focus of any safari to Africa. 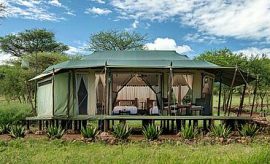 Linked by stout raised timber boardwalks, 25 delightful thatched chalets offer superlative accommodation with four-poster beds elegantly draped with mosquito netting, bedside tabletops and timber wardrobe. Glass walls and gliding doors give unrivaled access to Serengeti game viewing from the comfort of your own chalet, even from the stand-alone bath and the daring outdoor shower. A flush toilet, bidet and granite wash stand complete the bathrooms with running hot and cold water. A writing desk, chair and mini fridge are provided with charging power point. Private verandahs are furnished with coffee stand and chairs. Suite chalets offer extra facilities in an extended lounge with chairs, sofa, wireless and satellite TV. The bathroom also features double ceramic vanity basins. 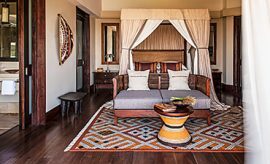 The unique design of Soroi Serengeti Lodge combines natural forms of stone and wood, textures of rope, canvas and thatch and colors of red earth and tawny grass to produce a restful and richly satisfying ambience. 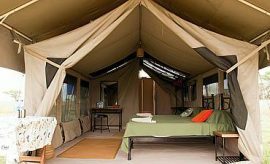 Freedom and adventure are the keynotes of a Tanzania safari with AfricanMecca, combined with comfort, elegance and style. Public areas comprise reception, lounge with library, WiFi and television, and a thatched open-plan dining-room with integral kitchen area. A magnificent infinity swimming pool features a waterfall on the open deck high above the valley below. There are also two sun decks with lounge chairs, a lounge deck with fireplace for evening relaxation and a convenient toilet block. Other services from obliging and attentive staff include spa treatments in the privacy of your own quarters. The annual migration is a must-see on your trip to Serengeti with AfricanMecca, but even during the other seasons, there are opportunities to see the resident animals that do not migrate. The area is famed for its large prides of lions, its herds of elephant, its abundant herbivores, and unusual small mammals, varied insects, fascinating birds and exotic plant life which can be seen at any time of the year on your tour of Tanzania. 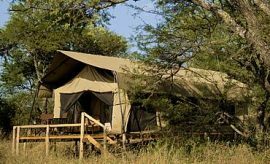 Game viewing drives are flexible and can be taken from early morning to early evening in sturdy, specially designed 4x4 safari vehicle with comfortable seating and panoramic views. Wireless contact with other guides ensures that your guide is in the insider circle of “tracking intelligence” that can succor in discreetly maximizing the most interesting wildlife events within striking distance. The AfricanMecca guides are passionate about the marvels of your tour in Serengeti. They will eagerly share their skills and knowledge of the wilderness concentrating not only big game but also the smaller marvels of life. Lions and hyrax can be found, sometimes together with the rare black rhino, around the protective ramparts of a granite kopje, or the furtive prowling leopard and timid tree-hugging bush baby that only come out when it gets dark. Your guides are keen to see you get the most out of your safari in Tanzania, and will prompt and encourage your unique interests, whether it is photographing the unusual silhouetted fantastic praying mantis', nocturnal hummingbird moths, or tiny, bright, jewel-like lovebirds clustering at food and water sources. 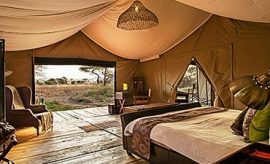 You can combine different locations on an extended tour in Africa, enabling you to try a dawn flight in a Serengeti hot air balloon, watch the migrating herds crossing the Mara River in the north, see a family of elephant on the limitless grassland, or thousands of flamingo in the Eyasi soda lake in the Rift Valley, but you will never forget the holidays to Africa that you could spend at the incomparable Soroi Serengeti Lodge. Morning tea with biscuits or rusks is served in the dining room where you can plan your day's activities with your AfricanMecca guide; thereafter, setting out on a cool, early morning game viewing trip before returning for a buffet breakfast of fruit, cereal, eggs, sausages, pancakes and waffles with hot meals to order. You can even take breakfast with you to extend your range. Or you can take a guided walk around the base of the kopje where a rich variety of wildlife and flora can be observed. Lunch is also served buffet style as a main meal platter with salad selection and choice of desserts. 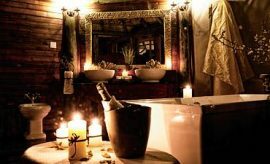 During the hottest part of the day, you may enjoy a siesta before afternoon tea when you will plan your mid-afternoon drive to coincide with the return of the wildlife to the water-holes and the emergence of nocturnal predators to partake in evening activity.Enjoy pre-dinner drinks by the fireplace, and join in with conversations with safari honeymooners in Tanzania excited to dispel heart-to-heart about their cherished wildlife encounter on the plains; thereafter followed by rumbling digestives, inviting dinner with a choice of starters, main meals and desserts, shadowed by coffee or a choice of herb teas at the end. These gourmet dinners are prepared and served in the dining room or can be enjoyed outdoors by the fire on the fireplace deck. 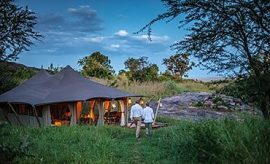 Bush meals can also be arranged at a more distant, dedicated sites of individual interest where with a live grill kitchen and bush bar. Food is freshly brought in from local sources. There is a well-planned wine list, a selection of beers, juices and soft drinks and fine warm beverages. Special diets can also be provided for when requested in advance. 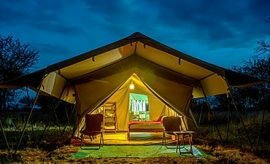 When staying at Soroi Serengeti Lodge in Central Serengeti (Seronera River Wilderness), we recommend combining it with your Northern Tanzania safari to Tarangire, Lake Manyara and Ngorongoro Crater. End your trip with a Swahili cultural tour and beach holiday in Zanzibar.